what jay has to say ...: fear of the phone?! Ever since I was little, I have hated talking on the phone. Even before technology evolved into pagers and emailing and then text messaging (so grateful for these changes) I didn't enjoy the telephone. I remember dreading it when I was at my grandma's and she would get a call from a friend or family member and she would say, "Come here Jaclyn, someone wants to talk to you!" What the hell was I going to say to this person who I couldn't even remember really because they were my 2nd cousin twice removed?! I've mentioned in previous posts that I have issues with anxiety so I know this is where the fear stems from but throughout college and into my working career, it was definitely an issue for me. Over the years it has gotten better for sure but I have always much preferred emailing or texting over actually talking on the phone. I'm an event organizer so lucky for me, email works really well for me because I can keep a paper trail of what people promise me and what I commit myself to. It was a random moment last week that I realized that I am cured!! Ha ha - not medically or technically - but when I'm given a task at work that involves a lot of phoning, I tend to procrastinate. This time, however, I was given the task of phoning about 100 people and started it right away, flew through it and then realized part way through that it was no big deal. I still prefer the writing over the spoken. I hate talking to people on the phone who tend to speak at the same time as you do and the conversation becomes seriously disjointed and hard to follow. But do I have telephone phobia? Not anymore, that's for sure. Telephone phobia (telephonophobia, telephobia) is reluctance or fear of making or taking phone calls, literally, "fear oftelephone". Telephone phobia is also considered to be a type of social phobia or social anxiety problem. It is often compared to the fear of public speaking, in that both require engaging with an audience to a certain extent, followed by the fear of being criticized,judged or made a fool of. As is common with various fears and phobias, there is a wide spectrum of severity of the fear of phone conversations and the corresponding difficulties. 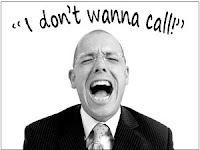 In 1993 it was reported that about 2.5 million people in Great Britain have telephone phobia. The term Telephone Apprehension refers to a lower degree of telephone phobia, where it is the anxiety derived from telephones, but less severe than that of an actual phobia. These people may have no problem communicating face to face, but have difficulty doing so over the telephone.